PARIS — Firefighters battled a massive blaze Monday at the French capital’s iconic Notre Dame Cathedral that sent ash pouring onto tourists and flames shooting out of the world-famous 12th century monument. It is unclear whether anyone has been hurt. 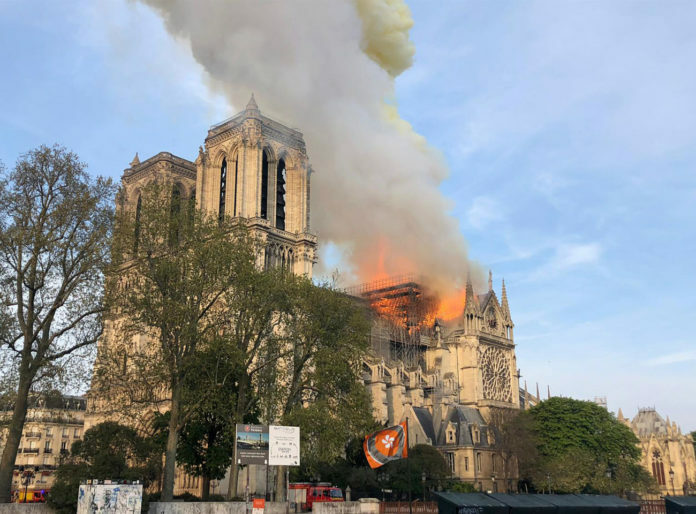 French media quoted the Paris fire brigade saving the fire is “potentially linked” to a 6 million-euro ($6.8 million) renovation project on the church’s spire and its 250 tons of lead. French President Emmanuel Macron postponed a televised speech to the nation because of the stunning blaze. Macron’s pre-recorded speech was set to be aired Monday evening, to lay out his long-awaited answers to the yellow vest crisis that has rocked the country since last November.